Are deputies paid enough for their heroic acts? A man in Decatur County is alive thanks to Deputy Colton Taylor. 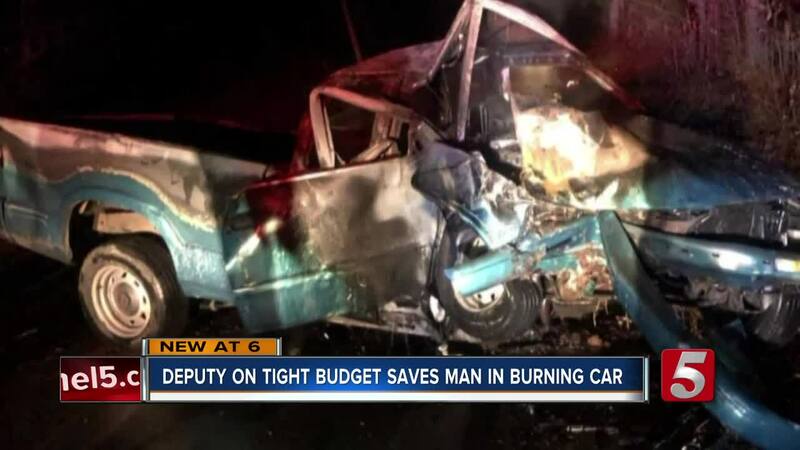 He pulled the man from a burning car, saving his life. DECATUR, Tenn. (WTVF) — A man in Decatur County is alive thanks to Deputy Colton Taylor. He pulled the man from a burning car, saving his life. But would you believe it's hard to make a living saving lives? It has us asking: just how much are safety and security worth? And, how much should someone be paid to protect you? Decatur County Sheriff's Deputy Colton Taylor was on patrol Saturday night when he came onto a wreck. "The cab looked like it was on fire and it was in flames when we pulled up," said Deputy Taylor. He told a reserve deputy to stay in the squad car, fearing the truck might explode. Then Taylor went right for the driver, who was screaming and trapped. "I reached under the left arm and grabbed the right arm and used the door as leverage and slung him onto the ground," said Taylor. He saved the man's life, but that's only part of the story. "He is on of my very best," said Decatur County Sheriff Keith Byrd who fears he may lose deputy Taylor. "He's like a lot of other young officers with bills to pay and children to support and it's a frustration for him and me," said the sheriff. That frustration gets back to my question: What should someone be paid to protect and serve? Consider that deputy Taylor makes. "My deputies make $12.74 an hour," said the sheriff. "This salary alone, as my only income, it's hard," said Taylor. By contrast, deputies in Davidson County start at close to twenty. But, those in smaller, rural counties often make far less for doing the same job. After all, a burning car can happen anywhere. Deputy Taylor says he lives to serve. "I love it. I don't see myself doing anything else," said Taylor. Sheriff Byrd just wishes he could pay his deputies more. "It's a terrible frustation," said Byrd. Each county sets the budget for the sheriff's department. Sheriff Keith Byrd can only hope Decatur County commissioners budget the money so he can pay his deputies more.